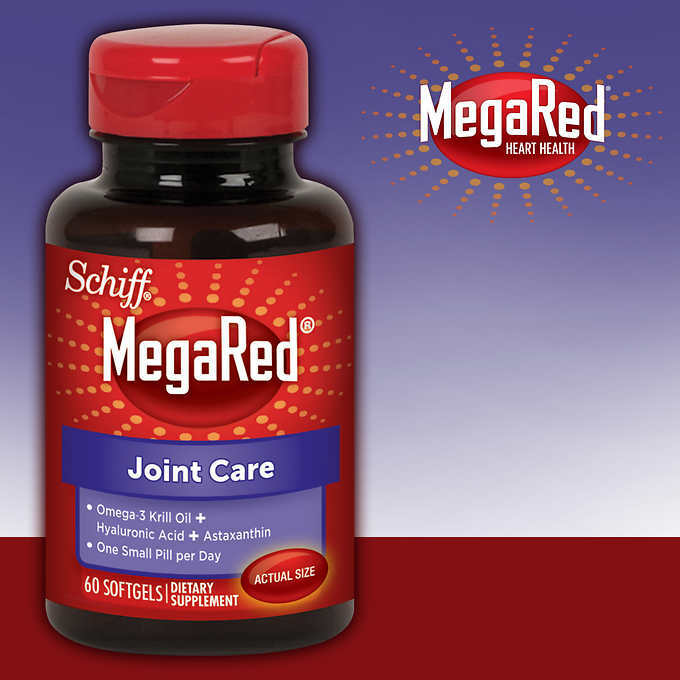 Schiff® MegaRed® Joint Care - 60 Softgels SALE! Our bodies can’t make Omega-3 fatty acids so we have to rely on dietary sources. Cold water seafood like salmon, tuna, halibut and krill are among the best sources, but Omega-3 fatty acids can also be found in some plants and nut oils. At least two servings of cold water fish a week are recommended to get adequate amounts of Omega-3. And unlike Glucosamine and Chondroitin tablets which can be larger is size, one small, easy-to-swallow MegaRed® Joint Care softgel per day is all you need. In an effort to promote sustainable practices, MegaRed® Krill Oil is sourced from the Antarctic Ocean where krill are abundant. The krill are harvested well below international catch guidelines from sources that use eco-harvesting, ensuring that only krill are harvested and not other marine animals. MegaRed®'s source for krill oil has been certified by an independent nonprofit organization that sets voluntary standards for well-managed and sustainable operation of fisheries. WARNING: People with shellfish allergy, coagulopathy or taking anticoagulants or other medications should notify their physician and be tested prior to taking dietary supplements. NOTE: If pregnant, lactating or on prescribed medication, consult your physician before using this product. KEEP OUT OF REACH OF CHILDREN. STORE IN A COOL, DRY PLACE WITH LID TIGHTLY CLOSED.